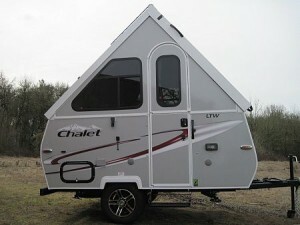 The LTW is Chalet’s entry-level pop up a-frame trailer. This model is both the lightest and the shortest model that Chalet offers, with a dry weight of just 1,150 lbs and hitch weight of 95 lbs, so it’s possible to tow with a ride range of smaller and lighter vehicles. It is also Chalet’s easiest model to store at home and maneuver around tight campsites that just aren’t designed for larger RVs. Although the LTW is Chalet’s only model that doesn’t come with their patented roof lift system, you may find that the lack of this innovative system isn’t a deal breaker due to the small overall size of the unit. Beyond that, it comes with virtually all of the same standard features you find on Chalet’s larger models. The LTW is Chalet’s smallest pop up camper. Image courtesy Chalet RV. The LTW comes equipped with virtually all of the same standard equipment as Chalet’s other models, including a two burner cooktop, 2.0 cf fridge, 16k BTU furnace, and a 3 speed reversible fantastic vent fan. It also comes with a single (rear) skylight, unlike the front and rear skylights found on other models. For optional equipment, you can also get almost all of the same features that are available from Chalet’s larger trailers. The notable exceptions are that the LTW is not available with additional seating, a ducted air conditioner, or a permanent rear bed, all of which have to do with the limited available space. 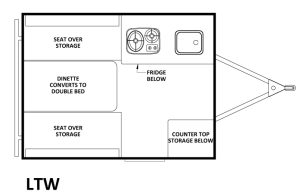 High sidewall package (38″), which includes a larger 3.0 cf fridge with freezer.